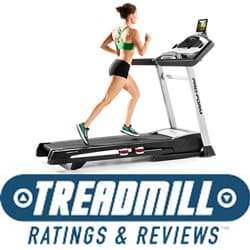 Our team here at Treadmill-Ratings-Reviews.com has experts with over 20 years of experience in the industry. We can help you sort through the junk to find the brands and models that provide the best value. Buying a treadmill is by no means a simple process. There are countless models that range in price from a couple of hundred dollars to $5,000. As a result, the quality can vary dramatically. When purchasing a treadmill, it is very important you find a model that is geared towards your usage: like walking, jogging or running. In addition, find a machine that can handle your height and weight. Other factors to consider are motivational programming features and whether they are important to you in reaching your fitness goals. Below, we discuss the different components that make up a treadmill. 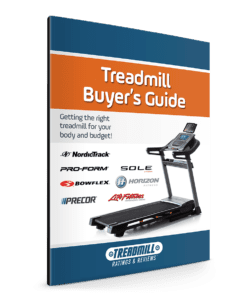 This treadmill buyer’s guide is designed to make you an informed consumer. It will help you overcome some of the confusion you may have encountered in your pursuit of a healthy lifestyle. A treadmill motor is one of the most significant components to consider when buying a treadmill. It is what drives the treadbelt. Depending on the quality and power, it can make the difference between a smooth running machine and a loud noisy treadmill that struggles to perform. For example, the NordicTrack Commercial 2950 comes with a 4.25 continuous duty HP motor. This powerhouse will accommodate serious runners, and will run effortlessly at higher speeds and steep inclines. In comparison, the ProForm Performance 400i comes with a 2.5 HP motor, which is better suited for walking and light jogging. 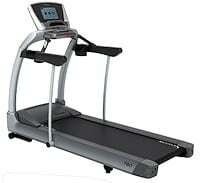 Very cheap treadmills will go as low as a 1.5 continuous duty HP motor, which generally has insufficient power. Click here for our Treadmill Best Buy recommendations. When comparing treadmill motors, pay attention to the continuous duty horsepower (CHP), not peak horsepower. Peak horsepower is the maximum horsepower a treadmill motor can reach. Continuous-duty horsepower is a measure of sustained power during regular use. The continuous motor power is what is consistently delivered during heavy usage, over an extended period of time. Since peak horsepower is usually significantly higher than a motor’s continuous capability, continuous horsepower better helps you determine which treadmill will accommodate your intended exercise use. Generally speaking, the larger the motor the more powerful it can operate at a continuous rate. Although some quality motors, like those on Horizon Treadmills, may have a lower continuous duty HP rating, and yet be better. At first glance, these machines may show lower horsepower, but their motors are so well built that they can deliver great results with less horsepower needed. Continuous duty is the standard in comparing horsepower. Unfortunately, there is no official standard rating and often treadmill manufacturers will exaggerate the actual continuous duty horsepower. Regardless, the continuous duty horsepower rating will give you some guideline. An indication of the quality of the motor will often be reflected by the extent of the warranty. A 90-day warranty will suggest lack of quality. However, you will find most treadmills in excess of $800 come with a lifetime warranty. Belts vary in length, depending on whether the unit is geared more for walkers/joggers or runners. Belt widths range from 16″ to 22″, while lengths vary from about 45″ to 62″. Getting the right size belt and deck size will impact the quality of your workout since a belt area that is too small will make you feel cramped or even cause dangerous tripping. In most cases, stay away from 16″ width belts. They are extremely narrow and offer very little room to move. For walking, an 18″ wide belt is adequate, but 20″ is preferable. We recommend the following guideline for treadmill belt and deck lengths. For walking 50″-54″ is adequate, depending on your height. If you plan to jog we suggest at least 54″. If you are tall or a runner with long strides, you should be looking at a 58″+ belt. Note: Many manufacturers measure the length by the length of the treadbelt. That is not a true measurement, since often part of the belt is covered by plastic shrouds. In the past a treadmill with a 60″ long belt would often cost a minimum $2,000. 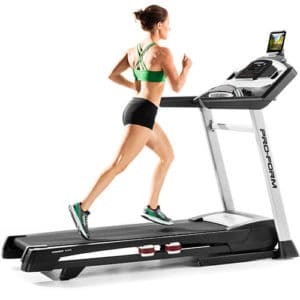 Icon Fitness, which manufactures NordicTrack and ProForm, is now offering treadmills with 60″ belts for as little as $1,000. Longer 63″ decks like on the Yowza Delray Elite are even starting to appear. A good treadbelt is going to deliver little noise and high performance. It should have a minimum 2-ply belt for long wear and sufficient cushioning. A 1-ply belt found on cheaper machines is going to wear too quickly. Quality treadmills will have belts that are pre-lubricated and waxed to provide minimal maintenance (if any). Expect up to 25,000 miles of service by simply keeping the unit clean (free of dirt). This lubrication/wax system is a special blend of high-pressure synthetic compounds. The design and make-up of a tread belt is a science onto itself. What is important is you want a belt that will provide extended wear and comfort. Once again, warranties on the belts are an indication. Any warranty less than a year would suggest potential problems in the future. We’ve seen that some companies will offer different materials on their belts depending on where the machine was manufactured. For instance, Yowza Fitness treadmills have two distinct styles of belts since their machines are built in two different foreign countries. Vision Fitness was offering a completely “maintenance free” treadbelt called the Infinity Belt. They wove wax into the fiber and then used a double coat of wax on their deck surface to reduce friction. Regardless of the brand you choose, it is important to keep your treadbelt clean. Occasional vacuuming is recommended. Dirt, dust, dog hair, etc., can get into the machinery and cause problems. The right exercise surface can help protect your joints and provide comfort. There are several types of shock absorption available. Sole F85 with a stiffer shock absorption ideal for running. Most treadmills have an elastometer design. They use rubber grommets that look like marshmallow to absorb the shock. Look for a treadmill that sufficiently reduces the shock of your impact without overcompensating and causing and overly bouncy surface. Runners may prefer a stiffer impact, which is what you will find on the Sole Treadmills. A variation of the elastometer design, is the diving board design. You have larger rubber grommets in the front part of the deck, which absorb the impact. There are smaller grommets towards the rear of the deck. That is because you want a stable, solid liftoff at the rear. 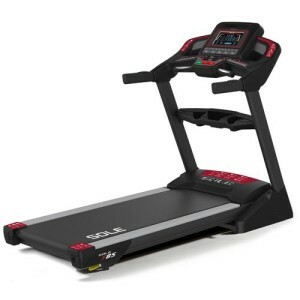 This type of cushioning can be found on Horizon Treadmills and Bowflex Treadmills. NordicTrack and ProForm shock absorption is slightly different. It acts like a suspension system on a car. There are external springs and internally there is a elastometer. With every step you take the deck relieves that impact and propels you to your next step. So there is not only impact absorption, but energy return. Some models will also have adjustable cushioning so you can change the settings for different users in the household. 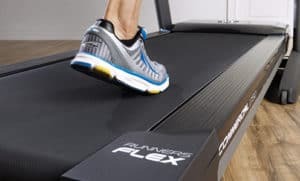 For example, the NordicTrack Commercial 1750 has Runner’s Flex cushioning with six dampeners that can be turned ‘on or off’ depending on if you want a harder or softer surface. Yowza Fitness has swing arm suspension that acts a bit like a WWE pro wrestling mat. The entire platform is stiff with a swing arm at the front of the machine that absorbs the impact along the entire deck. With some low end models, the deck will actually angle outward with the strike of your foot. As a result, your foot twists with each step, which causes stress and strain. Computer panel displays are either LCD (Liquid Crystal Display) OR LED (Light Emitting Diode). The displays come in all shapes and sizes. 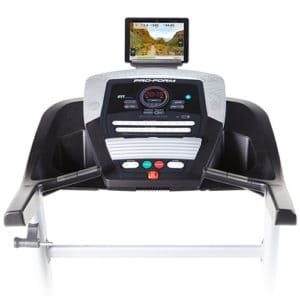 Many cheaper treadmills have LCD displays that are not backlit, and they can be difficult to read in a low light environment. LCD displays usually have one window that shows multiple readouts, while many consoles with LED displays will have multiple windows. Most treadmills have some sort of computer programming, ranging from a simple odometer and speedometer to pre-programmed workouts and storage capabilities. Computer controls can provide feedback such as speed, distance, heart rate, pace, calories burned, laps taken, time elapsed, incline and more (depending on the particular treadmill). NordicTrack and ProForm are offering several models with a full color Google Android browser display. They are like tablets and they allow you to access the Internet as you workout. They also allow you to visually enjoy the full potential of iFit Live. Several models that have this display are the NordicTrack Commercial 1750, Commercial 2450 and the Commercial 2950. Just about all treadmills come with a selection of pre-installed exercise programs. These programs control the speed and incline of the machine, and simulate various challenges like hill climbing and interval training. Having a variety of exercise workouts can break up the monotony of walking or running in place. Usually inexpensive treadmills will include several basic programs. The more costly models will have a wider selection that will focus on fitness goals like weight loss, cardio burn or distance training. In addition, some treadmills have user defined programs where you can create your own customized workout. The advantage of user defined programs is you can create a challenging workout and use it as a benchmark to go beyond. You compete against yourself. Keeping track of your progress can motivate you to increase the intensity of your workout and attain new goals. Many of the top models have incorporated some sort of fitness tracking programs to enhance your workout. Horizon has ViaFit, Sole has a Bluetooth connectivity with a free Sole Fitness App, and Bowflex also offers a free fitness tracking app. Each of these programs is available for free along with your treadmill (as opposed to the paid iFit Live service described below.) Many of these fitness apps integrate with existing fitness apps that you may already be using. These include apps like MyFitnessPal and AppleHealth. 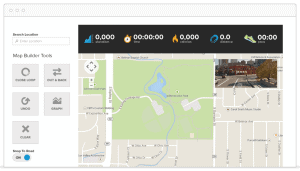 ViaFit, in particular, also allows you to use their Virtual Active programming to run along virtual routes that have been filmed in famous national parks and foreign cities. Some of the machines are able to display this directly on their console screens, while some require a one-time Passport box to connect your treadmill to your TV display. 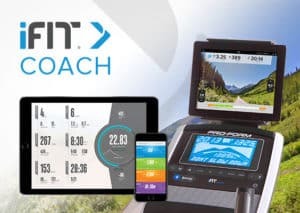 iFit Live is one of the most popular fitness tracking platforms available on machines built by parent company Icon Fitness (including NordicTrack and ProForm.) This technology allows your treadmill to communicate with the Internet through Wi-Fi similar to how Horizon’s ViaFit, Sole’s Fitness App, and Bowflex’s Fitness App work. As with these other programs, you can go to a website and define your fitness goals and track your workouts. iFit will provide a personalized 8-week training program that will be downloaded onto your treadmill. It includes audio coaching. After every workout, your stats are uploaded to your iFit Live account so you can track your progress. One area that iFit excels above the competition is through their use of GoogleMaps. You can trace a route anywhere in the world and iFit Live will simulate the terrain by adjusting the incline. If you have a treadmill with the web-enabled Android browser, you can view a street, satellite or earth view of your progress. If you have one of their LCD models you can place a laptop, smartphone or tablet on the console for the Google Maps views. There is also a library of predetermined routes through famous city landscapes and trails in National Parks. In conjunction to the Google Maps feature, NordicTrack sponsors races, where you can watch your progress in comparison to the leader and the pack. 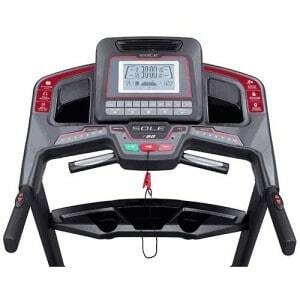 There are several different types of iFit machines from NordicTrack and ProForm including treadmills labeled as iFit “Enabled, Bluetooth Ready, Compatible, and Ready.” The compatible machines require the additional purchase of a Wi-Fi module (about $100) to connect to the internet. It should be noted that their is a subscription fee for iFit Live. If you choose not to pay the ongoing fee, then you can use the machine’s regular programming without the iFit Live workouts and online account. NordicTrack and ProForm offer some of the best “bang for the buck” so the option of paying or not paying for this extra feature can be seen as either a pro or a con. 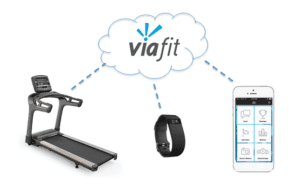 Fitness tracking apps and connectivity from other companies like Horizon, Sole, and Bowflex do not require an additional cost. There are a variety of heart rate options available on treadmills. The basic is heart rate monitoring, where you grip sensors to get a read-out of your heart rate. There is also heart rate control (HRC), where either through holding the sensors or with a wireless chest strap, the intensity of your workout is controlled by your heart rate. This allows you to keep your workout within a preset zone. Most treadmills maintain your heart rate zone by adjusting the incline. Although some also have the option of allowing the speed to adjust the rate. 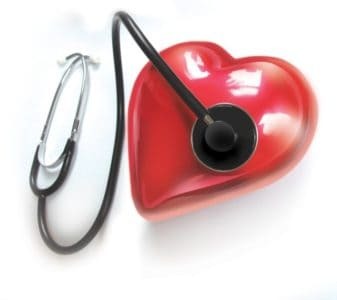 Note: The wireless heart rate control usually gives you a more exact reading of your heart rate. A major component in providing no hesitation walking/running and long treadbelt life is the roller system. In design, there is no substitute for size. Basically the larger the roller the better. That is why commercial treadmills are equipped with very large rollers. Treadbelts with larger rollers can run with less tension. Less tension results in longer life to both the belt and roller bearings. This is because the larger roller diameter has more area to “grip” the belt (traction) and prevent slippage. Large rollers turn more slowly at all speeds. This obviously reduces wear to the bearings. For example, treadmills with 2.5″ rollers run up to 43% slower then smaller rollers. Small rollers mean small bearings. 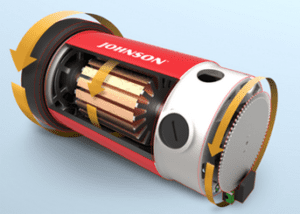 Large bearings in rollers mean large load capacity, up to 40% more! This adds longer life. The treadbelt doesn’t have to bend as sharply as it is forced over larger rollers. Support fibers (polyester) in the belt will last longer by staying cooler and not flexing as much. The more flex, the more heat, especially on a very tight belt (necessary to prevent slippage) with units using small rollers. Larger rollers have more surface mass to absorb treadmill belt heat. Treadbelts can run hot! The cooler they operate, the better. The backing lasts longer, the splice is stronger and the PVC top coat doesn’t “migrate” (bleed through) to the deck (causing friction). Better precision bearing alignment is maintained. Because with large roller size, you also get much more strength. Larger axles (bigger bearings) are also stronger to minimize flexing between the mounting points of the roller. You’ll find that most of the Sole Treadmills come equipped with 2.75″ rollers, while a couple of NordicTrack treadmills have 3″ rollers. The warranty reflects the quality of a treadmill. A 90-parts and service warranty suggests a machine that lacks durability. A warranty that covers the parts and labor for a number of years implies a low maintenance machine. Over the last few years warranties have generally increased. In fact Sole, NordicTrack, ProForm and Horizon all have models with lifetime motor. If you are trying to decide between two different models, use the warranties as an indicator of overall quality to help you pick a machine. No treadmill buyer’s guide would be complete without mentioning the importance of the reputation of the company. Only purchase from a business that is known for both the quality of their products and their commitment to customer satisfaction. We strongly recommend that you do your research before you buy. It will pay off in the “long run”. We do our best to keep up-to-date on which brands are providing the best service and which are reliable with customer service. We’ve seen changes over the years. For instance, two companies that we used to caution buyers against have drastically stepped up their game in terms of quality and customer service. On the other hand, one company we used to recommend highly has started to let their service slip and we’ve removed them from our recommended brands list. iFit Live: How Does it Work? What Treadmill is Right for Your Body Type? Is a Treadmill Desk Right for You? Should You Buy a Used Treadmill? Treadmills vs. Ellipticals: Which Should You Buy?